The term 'legend' is often over-used in gaelic football commentary nowadays but in the case of Kerry's Tommy Doyle it can be said without fear of contradiction. A prince amongst half-backs in his hey day, the Annascaul great boasts seven All-Ireland SFC medals, three All-Star awards, three All-Ireland U-21 and 15 provincial medals across all grades to his name. 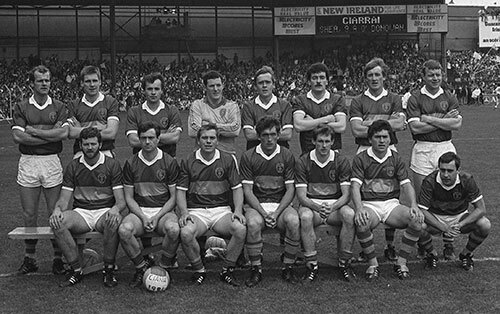 Not since the golden era of Kerry football in the seventies and eighties has one team ruled the gaelic football landscape with such an iron fist as Jim Gavin's Dublin. Dublin may have only two All-Irelands to show for their efforts so far but the ease at which they are blowing away all-comers has drawn inevitable comparisons to Mick O'Dwyer's all-conquering famed Kerry team. 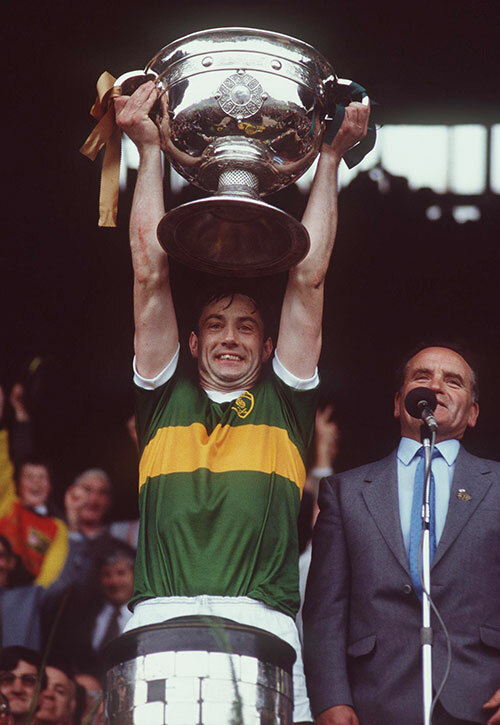 1986 All-Ireland winning Kerry captain Tommy Doyle not going to be drawn into that hypothetical debate but he firmly believes the likes of Pat Spillane, Mickey Sheehy, Jack O'Shea & Co could hold their own in the modern game and could still win All-Irelands because that team could adapt to any style of play. "At the end of the day, are lads fitter? We put a lot of work in on the training ground and were as fit as we possibly could be," he opined to hoganstand.com. "Mick O'Dwyer was the driving force and was a way ahead of his time in terms of his training. He was also a great tactician and man manager. Would Micko be capable of managing a team to win an All-Ireland today? Absolutely, he would be capable of managing on a professional level at the likes of Liverpool, a club I love." Tommy had some interesting observations to make on the current state of gaelic football and it's fair to say that he's not a fan of the blanket defence system. Placing a greater emphasis on defence than attack is a foreign concept in Kerry and not their way of going about business. He understands that some managers have no option but to adopt a system that allows their team be competitive but adds it would not be accepted in Kerry. "In my book, at the end of the day, football is all about one thing - winning. But scores must be achieved to win. Defenders have a job to do but the ball must be moved forward intelligently to achieve scores. "The game changes and things evolve but that doesn't mean you have to be negative. Dublin don't play all their players behind the ball, they are still playing the game the way it should be as are other traditional counties such as Mayo, Cork, Kildare, Galway, Meath and Offaly. "The number one objective is to score. From an entertainment point of view, the style of football being played by Dublin today is what spectators want to see." Despite the loss of Colm 'Gooch' Cooper, Kerry have caught the eye under Eamonn Fitzmaurice en route to reaching the last four of the All-Ireland SFC for the second year running. Kerry issued a statement of intent when inflicting a 12-point defeat on arch-rivals Cork in the Munster SFC decider and, delighted that the local rivalry is as healthy as ever, Tommy admits it was a result that caught him by surprise. "If you told me beforehand that we would win by a point I would have been delighted but they were very impressive. Our players are young and, with a little bit more experience and our tradition, you can't write Kerry off. "It's all about the next day against Mayo. Croke Park is our spiritual home, as much as it is Dublin's, and I am confident that our lads will perform there." The emergence of James O'Donoghue and Paul Geaney augurs well for the future, he adds, and he has full confidence in Fitzmaurice and his backroom team. "They move the ball with pace and intelligent foot-passing. They don't overdo the hand-passing and there is no going backwards," Tommy - who served as a Kerry selector during Mickey Ned O'Sullivan's reign (1989-'91) - adds. "The young players have stepped up to the mark and their forward play is straight out of the Mikey Sheehy book, leaving lads one-on-one inside. The tactics have worked out well so far, similar to Micko in his time. "In the All-Ireland semi-final last year, Dublin had the edge on us in terms of experience and fitness but we'll take each game as it comes. Our back-room team will leave no stone unturned. They know the expectation that is within the county." On the club front, emigration has hit the west Kerry outfit Annascaul hard but they continue, in the best tradition, to strive to field as strong a team as they can. "We had a huge set-back two years ago with the passing of my nephew Bawnie O'Driscoll at 28 years of age. He was a fantastic player for us and the county and we received fantastic support from counties around Ireland. I would like to particularly thank Mickey Harte for his time and encouragement. I would like to thank Mickey and his good wife for the time they spent with us in Annascaul and any family. "We're a small rural club and have lost a lot of good players and people to Australia and Canada," Doyle continued. "We can't afford to lose any players but unfortunately that's the way it is. In my time we reached the county final in '96 but were the beaten by eventual All-Ireland club champions Laune Rangers." Equally renowned for his business acumen as for his prowess on the gaelic football field, Tommy spends his working week as General Manager of Kinsale Bay Food Company. Established six years ago, Kinsale Bay Food Company is a dedicated food manufacturing seafood company, specialising in restaurant quality food products with signature seafood dishes at their core. "Our motto is 'bring the restaurant quality home'," explains Tommy. "The company was recently taken over by Mr Jim O'Mahony, former CEO of Golden Vale, and his business partner Mr Frank Goh. "They have secured the future of the company and are developing the business in the professional manner that it and it's employees deserve." Creating wholesome dishes that are free from artificial preservatives and additives, also are all gluten free without compromising taste. Kinsale Bay Food Company count Tesco, Dunnes Stores, SuperValu and BWG amongst their client list. Current Offaly senior full-back Shane Sullivan is employed as a sales developer by the Kinsale Bay Food Company for the Dublin area. "Hopefully, some day he and Offaly will have their rightful place back in Croke Park," concluded Tommy.